No need to get upset or worried, this is just a head’s up for people who may not check the paperwork in their delivery (especially at this busy time of year). 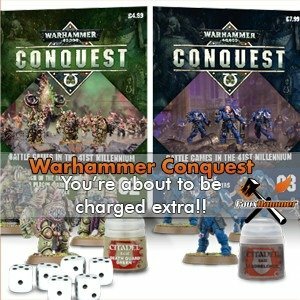 For those of you who subscribe to Warhammer Conquest. This month included a little extra note. 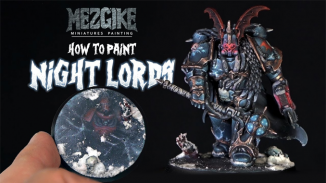 I didn’t pay much attention at first, I saw the picture read the headline and quietly assumed it was adversting a new Games Workshop Book. As someone who is uninterested in books and is only picking up the Warhammer Conquest magazines for the monthly figure delivery. this was quickly dismissed. However, this is actually advising you that you are about to automatically charged for the book. Unless you call and explicitly state that you do not want the book. 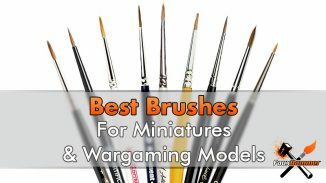 For over thirty years, the heroics and the horror of the Warhammer universe have been immortalised in art. 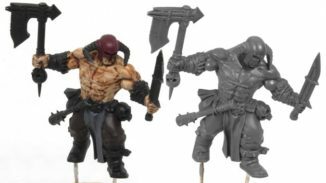 Discover a brand new a limited-edition book full of incredible artwork by some of Games Workshop’s best artists. The art in this exclusive product depicts the superhuman Space Marines and their sworn enemies, the disgusting. mutated forces of the Death Guard. 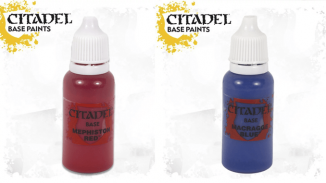 Your high-quality hardback book comes with a protective sleeve and makes an exciting addition to your Warhammer 40,000 collection! This special one-off book comes for the special subscriber price of £14.99 (€19.99 for ROI). 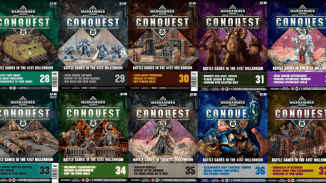 As a subscriber, we have already reserved a Warhammer 40.000: Conquest Art Book for you and it will be sent out automatically in your next dispatch. 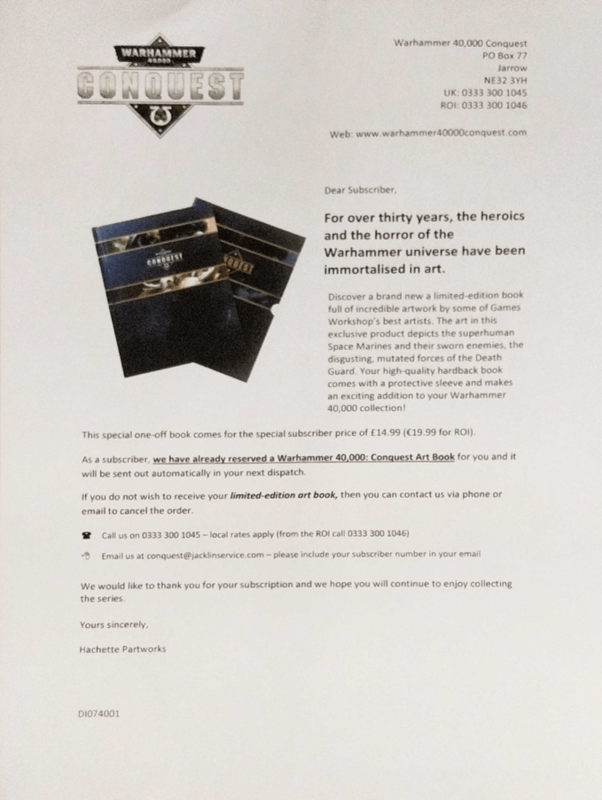 If you do not wish to receive your limited-edition art book, then you can contact us via phone or email to cancel the order. 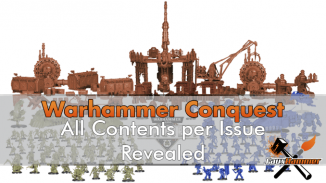 This isn’t unusual behaviour from part-works magazines and I don’t expect it will be the last time we see it happen in our Warhammer Conquest Subscriptions either. After all, we are only just about 1/4 of the way in. Hachette’s phone lines are only open 9am-5pm Mon-Fri. they aren’t open on weekends. I have Zero Confidence in their email service. I suspect they would either cancel your whole subscription or just ignore you! Personally, I’m not thankful that they’ve taken the trouble to reserve one on my behalf. I’ve already had issues with Hachette’s Customer Service and I’ve noted the issues many other people have had in my Issue 1 Review when it comes to trying to cancel the subscription. 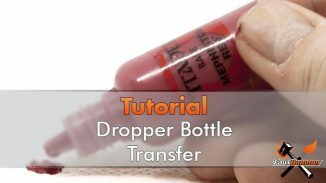 What do you think of this practice? do you want this artbook? let me know in the comments. As for me, I need to go and make a phone call. 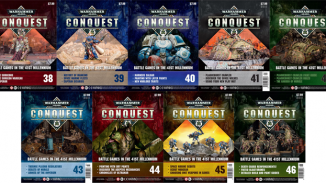 As a subscriber, I will also automatically receive any special issues of Warhammer 40,000: Conquest and I will have the option to opt out beforehand by email or phone. As a subscriber, I will automatically receive any binders as they become available at a cost of £7.99 (€9.99) each. As a subscriber, you will automatically receive binders as they become available at £7.99 (€9.99) each. 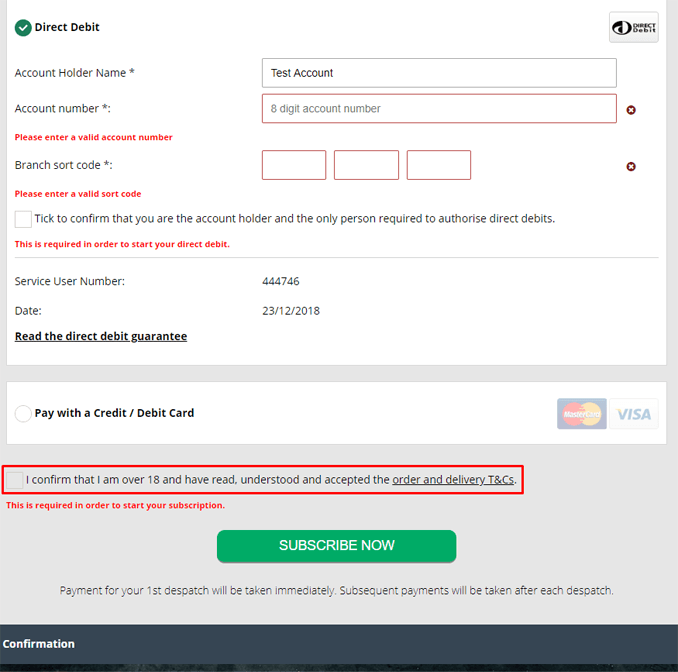 You will also receive special issues, though you will have the option to opt out of these beforehand. 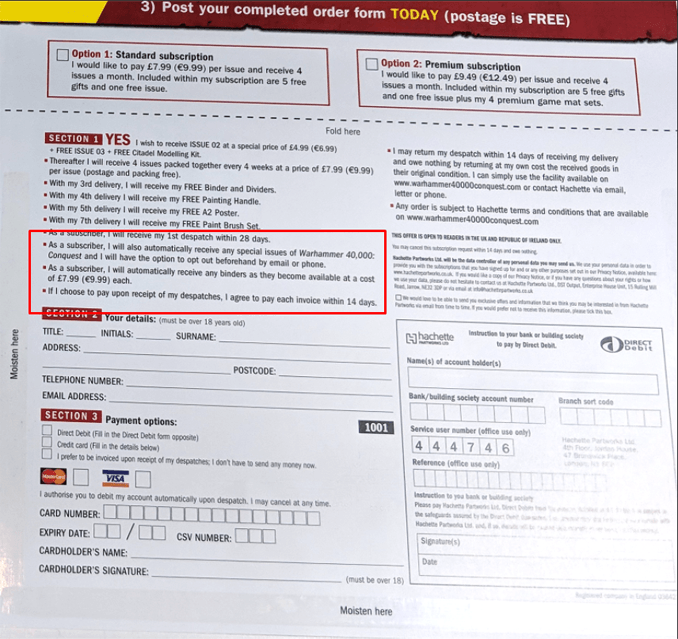 You do however need to click on “order and delivery T&Cs” to view this. I for one, subscribed online and did not read this specific condition and I imagne that many people also didn’t and are surprised by this. So yes, this is on us for not reading thoroughly. But I completely stand by the statement that cancellation may not be a simple case of calling or emailing. I know of may reports where requests to change addresses, resolve missing deliveries and cancel subscriptions have been ignored. 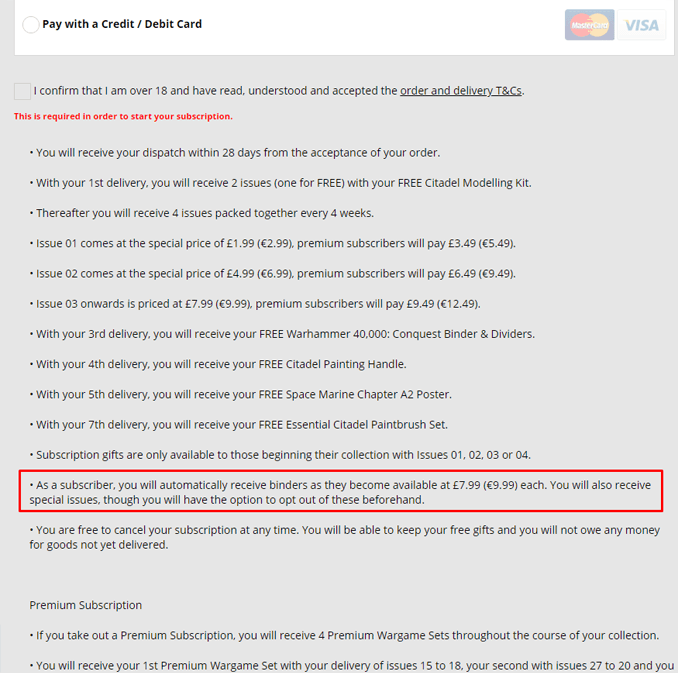 I’m also a bit surprised to find I’ll be charged an additional £7.99 per folder they send me (an undisclosed qunatity). Even though I personally have no use for them as I tend to bin the magazines. Can I even send these back? 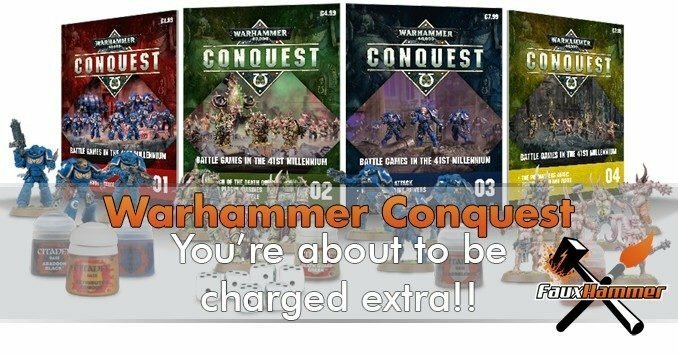 Warhammer Conquest is about to charge you extra! Yes like you I just ticked the box and read nothing of the T&C. Completely agree that the customer service is beyond lacking. However, what I have found is if you use the Facebook messenger app to talk with them they get back to you rather quickly and so far they have resolved all of my issues. I have also found that speaking to them via Facebook messenger will get a response. Good note!